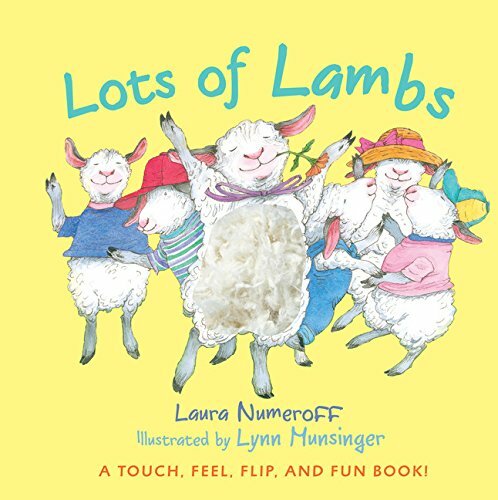 Lots of Lambs by Laura Numeroff is an adorable new board book about baby lambs behaving like everyday, playful toddlers. Using comparisons and contrasts as a central theme, the book gives examples of “happy” lambs and “grumpy” lambs; old grandpa lambs and baby lambs; and even “morning” lambs and “nighttime” lambs. There are funny city lambs climbing out of taxis, and country lambs harvesting vegetables, singing lambs holding microphones, and quiet lambs trying to get a little studying done. There are indoor lambs and outdoor lambs and playful lambs versus sleepy lambs waiting for a kiss goodnight. If you’re looking for a lamb book, this one presents every type of lamb you can possibly imagine—except lamb stew, of course. Lots of Lambs is a sturdy creation that should withstand the most destructive little fingers, the most abundant drool, and the most relentless little baby teeth. The child-friendly cover sports several ecstatic lambs, one with a huge tuft of cottony hair that toddlers can tug and feel to render it a bit more realistic. The frolicking lambs inside hide behind coats, fly in planes, and even appear on stage, and toddlers must use their fingers and their problem-solving skills to open coats, launch planes, and push back stage curtains to find them. Aside from its entertainment value, the hyperactive characters inside may actually coach toddlers to learn how to open and shut the book, turn the pages, turn back when they remember something interesting, and interpret the pictures and facial expressions on each page. A wonderfully lamb-filled experience that reveals a bright, colorful, and often slapstick world to toddlers who are just learning what books are all about.